The fourth and last trajectory RB identifies is not a specific narrative, but a characteristic of them all: it is about movement of people. At Corinth God demonstrates his MO of working through the least to reach the many (1 Cor. 1:26ff). Thus God constantly overturns human status by initially prefering the lowest. This strategy is epitomised at the cross, where God is revealed fully in a dehumanised object of shame. When God raised this one he defined the dynamic of his kingdom: blessing to the many through the lowest. His love ‘has to reach the strong via the weak’ (p.50). Paul’s own ministry was unsettling for people because he modelled the same pattern, thus radically contradicting social values. This trajectory gives the church’s mission an inescapable socio-economic aspect. It must begin as a downward movement towards to people at the bottom of the social heap. The rest will only be saved through and with them. I love this little section. It hits hard. I only wish it were more expanded. This bit of theologising draws its insights from all the bible discussion that’s come before. It adds value by identifying this common thread running throughout, and showing how it reaches its climax at the cross. RB’s description of the cross in this passage (p.52) is worth the price of the book! And there is so much challenge here for evangelical churches, entrenched as we are in the middle/uppermiddle classes; addicted to reaching the educated first. ‘To all the least by way of the privileged’ – that is surely our motto. We haven’t nearly faced up to the gospel reality that RB draws out here. We don’t like to admit that mission can have a socio-economic or political dimension. Until we do, we will fail the test of faithfulness – let alone fruitfulness! You’ve heard us tar all evangelicals with the same brush, that we are pre-programmed to misread and distort the Scriptures. The Grit retracts. We fall on our oyster-shell-edge. We are chastened. I’ve just read an example of some very careful reading and reflection and synthesis of the Scriptures’ teaching, in the light of the theology of the whole Bible, with accurate pastoral application. Stunning. It was by Dr John Woodhouse. Topic was Divorce and Remarriage. It’s the best thing I’ve read on this topic. And it’s short. But more to the point, Woodie’s paper is a model of how to approach the Scriptures. Calm, level-headed, and questioning everything. Everything we are supposed to believe on this topic, that is. A true piece of independent thinking. I would recommend this article to you, not just for the content, but for its value as a model of reading Scripture well. Which is more important, even, than right thinking on divorce and remarriage. IMHO. It may have come as a bit of a shock, through these articles, to realise that our modern Lord’s supper practices are so out of step with those of Jesus and the apostles. How has this happened? In trying to answer this, let’s start by imagining a typical scene from a Reformed Presbyterian church (my background). It’s communion Sunday. It’s a big deal, everyone has been preparing themselves – everyone, that is, who is planning to take part. At a certain point in the church service that day, the minister calls the faithful to come and gather round the table of the Lord out the front. He explains who is invited to eat – members of protestant churches in good standing – and issues a warning about the dangers of anyone else taking part. Those who are permitted move to the front, and gather at the table. Around the church building are dotted individuals and pockets of people who are not welcome to partake. They remain as witnesses to the celebration which is denied them. This, it is thought, may stir them up to consider their own stated before God. After all, why are they barred? I don’t know how you feel about that scene. I experienced it many times. I am adducing it now as a kind of very clear expression of protestant Lord’s Supper practices. Other churches soften the blow, minimise the feeling of exclusion, etc. But the underlying theology, I think, the same, and is enacted in that Reformed Pressy church very accurately. What can we say about this communion service? How can we understand what is going on here. 1. Firstly, it’s worth noticing that one of the motivations at work is the concern to protect the integrity and purity of the table. The practice of exclusion is not a goal in itself, but partly a by-product of this overriding concern. 2. It’s also important to add that this church believes it would be bad for outsiders of uncertain status to take part in the meal. It would, in some way, be bad for their souls. From that point of view excluding them is an act of kindness. 3. We do however need to compare this meal, and the motivations that shape it, with those described in the NT. On the surface of it, it appears that the ‘faithful’ believers in this Reformed church are playing out the role of the Pharisees and priests, carefully guarding against the sort of loose table fellowship that Jesus practiced habitually. I.e. they have slid back to the traditional, conservative, ‘safe’ approach, and lost the radical imperatives that were driving Jesus’ ministry. 4. It might be helpful then to imagine this Reformed Lord’s Supper transplanted back into first century Palestine, in the time of Jesus. Let us imagine that Jesus was physically present. Based on his behaviour as recorded in the Gospel accounts, which part of the room would Jesus be in during that table celebration? Would he be up the front at the table with the approved – or in the pews with the excluded? To me the answer is bleedin’ obvious. I reckon, based on his outrageous record, he might well have brought a packet of crackers and started handing them around in the pews during the communion! 5. We need to understand how our churches came to take this stance, which appears to be so different to Jesus’ own. Much of the drift has probably only been possible because the Lord’s Supper at some stage ceased to be a meal, was abstracted from the household setting, divorced from the realm of hospitality, and ceremonialised into a public ritual. In a public ritual, anything goes, the priests can make their own rules. But in hospitality, this is not the case. In every culture there are strict rules about how to treat guests, which demand obedience. Had the communion remained a meal, such a gross offence against hospitality as I have described above could hardly have occurred. Who would ever serve a meal in their home and deliberately exclude certain of the guests, making them look on while the others ate? Who would ever imagine that this could be a blessing or anything but a grave stumbling block, to the excluded? 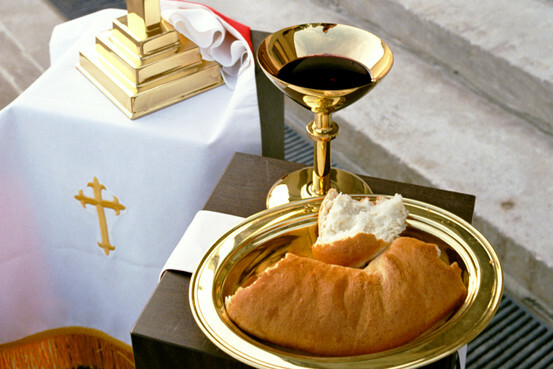 As it is, our Lord’s Supper is not really celebrated as a meal at all – it is something more abstract and ‘religious’. This allows for all sorts of distortions to creep in: the priests have gained control. As a result, the theological heart of the thing has been obscured or lost – namely, the idea that we are sharing a sacrificial passover meal together around Christ, like his disciples at the Last Supper. The last observation above suggests a way back. A Presbyterian church I know accidentally started on this path. They decided to incorporate the Lord’s Supper celebration into a church lunch held after the morning service. It just so happened that on that day some Muslim friends came to church. Once they had come, everything else followed necessarily. They were naturally included in the general invitation to lunch. They said they would stay. The elders then began to panic, realising what they had got themselves into. They held a brief crisis meeting. What to do? Should they do their warning and exclusion thing? It had always seemed like a good practice in the church service, but now that the setting was a lunch, it seemed impossibly rude. It would certainly offend their lunch guests. They decided that the offence would be too great, and the visitors should be allowed and invited to share in the celebration. This is what then occurred. The Muslim friends share in the table of Jesus. In moving the communion back into a meal setting, these elders immediately found they had to break with hundreds of years of church tradition. Their own views of what was right for the Lord’s Supper were stretched way outside the comfort zone. It all got very messy very quickly. A reformation of communion practice is hardly possible until we restore the heart of the celebration – it’s status as a shared meal. Any right theology about the Lord’s Supper is going to flow out of that starting point. Any other starting point will leave us once again bogged down in distortions, asking the wrong questions, and subjected to the pious intentions of the priests. Border protection and the Lords Supper: 4 – but what about 1 Corinthians 11? As a school teacher and later as a parent I have been witness to many attempts at reading, and I’m quite conscious of how difficult it can be to read and understand a written text. There are so many ways to misunderstand writing. But I have to admit, of all the bad reading and failed reading attempts I have encountered over the years, the worst of all has been that of evangelical Christians when attempting to read the Bible. We evangelicals seem to be pre-programmed to misread Scripture. We do it habitually. I won’t attempt here to go into the reasons for this, but one of the most spectacular examples (out of a pretty strong field of contenders) is what we have done with 1 Corinthians 11, where Paul writes about the Lord’s Supper. 27 Whoever, therefore, eats the bread or drinks the cup of the Lord in an unworthy manner will be answerable for the body and blood of the Lord. 28 Examine yourselves, and only then eat of the bread and drink of the cup. To take the Lord’s Supper in an unworthy manner is to ‘eat and drink judgment against themselves.’ (v.30). 2. outsiders or unapproved people who participate are doing themselves harm and incurring God’s anger. 3. it is therefore the duty of the church to warn off unapproved people or outsiders. 4. every participant is in danger of accidentally eating in an unworthy manner. This would bring down God’s judgement on them. 6. each participant should spend time in self-examination before the communion, in case there are any sins they have overlooked and not repented of. Major emphasis: excluding outsiders and unbelievers from the table. The main problem with this construction, however, is that almost none of it can be found in 1 Corinthians 11, the one and only proof text for our evangelical practice. It is not that hard to find out what the apostle was actually trying to say – he’s clearer than usual in this chapter. There can be no possible justification for Jesus’ disgusting and treacherous behaviour at the meal table. He does what no Jew could in good conscience do. At least, that’s how it appeared to the religious authorities in Israel. What was it Jesus did that so upset them? Mark and especially Luke present Jesus as not only welcoming but also eating with outcasts. Jesus extends table fellowship to these people. In doing so, he busts through and busts up the borders that protected Israel and the table of Yahweh at which Israel sat. He admits the unclean to the holy meal. You can see why the scribes etc were so incensed. This must have seemed like a gross betrayal of Israel and a pollution of the purity of her worship. For the ‘sinners’ themselves, inclusion in the meal implies much more than just social contact: it speaks of restored participation in the community of salvation. In breaking through the borders around Israel’s table, Jesus ‘re-enfranchises’ these outcasts, drawing them back to belong once again to Israel – and to Israel’s God. Jesus’ behaviour is all the more reprehensible because of his status as a famous Rabbi. The religious significance of his practice could not be hidden. In fact we can go further: when Jesus extends table fellowship to sinners, he does so not just as a member of Israel, but as Messiah, as the leader of the nation which he himself is regathering. These outcasts are welcomed into direct fellowship with the king, invited in to take part in renewed Israel – an Israel from which many well-respected people remain excluded. For the Jewish authorities, it must have seemed like their worst nightmare: Jesus seems determined to trample on everything sacred and create mayhem wherever he goes. He appears to be set on a program to break down the very identity of God’s people Israel: an identity up till now preserved by rigorous border protection. If Jesus destroys the borders how will Israel hang together any longer? It’s as though he is turning the nation inside out: the unclean are welcomed at the table of Jesus, while the authorities and the well-respected are kept at arm’s length. Messy, confusing, careless, dangerous, reckless, blasphemous, polluting, treacherous: these words would have sprung to mind for traditional Jews seeing Jesus’ table practices. Jesus is not interested to defend his table-fellowship practice nor all the messiness and confusion it must have caused. But he is interested to explain what sort of table he was sharing. The end-times wedding day has arrived, when feasting and not fasting is in order (cf. Luke 5:34). The table is a banquet table. Jesus himself plays the role of the bridegroom, at the centre of festivities. And he is re-organising the whole table. From now on membership of Israel will be defined solely by connection to him (cf. 6:46-49; 8:21). It will be a new identity dependent on the centre, not on the borders. Thus there is a call inherent in Jesus’ table-fellowship: a call with a decisively eschatological edge to it. Outcasts are not merely invited back to something they once had. The reason they are now welcome is because something new is happening. The day of restoration has arrived, and Jesus through table fellowship calls sinners to participate in the end-times banquet that his kingdom is bringing. Though they may not release this at first, the outcasts are being welcomed in to join in celebrating Jesus’ glorious reign. Is Jesus not worried about protecting the purity of the table? Not at all, it seems. What happens at Jesus’ table is far more powerful than that. Rather than the table becoming polluted, the holiness of the table seems likely to infect those who come to it. Think 0f Zacchaeus. One exception to this tendency is Judas Iscariot. He took part in all the meals, including the last one which had such overt sacrificial significance. And yet Judas’s heart was never won for Jesus. Jesus knew this, yet still did not feel it was a problem to eat the meal with Judas. There was still no need to protect the table or its holiness: it just doesn’t seem to have been the sort of thing that needed protection. Tomorrow: how the Lord’s table explodes across the world. In our Protestant tradition, we say the Lord’s Supper is only for those who can make a clear and credible profession of faith in Christ. Some churches even go so far as to threaten damnation for those who take the meal without faith. Other traditions encourage everyone to participate. But not us. We thought we might take another look at that tradition. Are we Proddies on the right track? Fortunately there’s a stack of material about this in the NT, especially in the Gospels. The first thing we should notice from the Scriptures is that eating meals was a big deal for first century Jews. Table-fellowship was an essential element of temple-worship – it was Israel’s way of having fellowship with God. Faithful Jews would sit and share in Yahweh’s table. In fact – and this is the biggy that we need to get our heads around – all meals in Israel, whether at the temple or not, had a sacrificial dimension. All meat slaughtered had a ceremonial significance. All the blood belonged to Yahweh and was offered to him. The table at which God’s people ate was always, by extension, holy. It remained the table of Yahweh. This one fact has the potential in it to turn our view of the Lord’s supper upside-down. So let it sink in. Eating was a sacred act. And therefore the table of Israel was to be kept pure and unpolluted. And there was the rub. On this point turned much of the social life and cross-cultural relations of the Jewish people. For if you were not a faithful Israelite, you were barred from the table. And there were many ways to land in that category. Israel, like all societies, was stratified. At the bottom of the pile were the untouchables, the unclean ones, often called ‘sinners’. Whether through disease or through a shameful occupation, or some disgrace, these ones were put outside the community of God’s people. Others would not eat with them. But this table-fellowship was an essential element of temple-worship – it was Israel’s way of having fellowship with God. Barred from the temple and it’s table fellowship, sinners were cut off from their birthright of participation in the covenant. And it was in this covenant that all Israel’s hopes of salvation lay. So ‘sinners’ exclusion from the table was not merely social: they were effectively excluded from salvation. Foreigners were automatically excluded. A good Jew would not eat with a Gentile, for Gentiles were unclean. So eat with them would be to admit them to the table of Israel, Yahweh’s table. And they would pollute it: it would be blasphemy. Insular, insecure, anxious, protective, exclusive: these are words that describe the mentality of first century Jews towards meals. Eating was a highly charged business. It was the place where Israel’s border protection happened. Our Protestant approach to the Lord’s table mirrors this tradition closely. Why bother about the church? A closely related concern is whether a ‘hearing not seeing’ approach to the Word does justice to the identity of the church as the gathered community of Jesus. So then the work of Christ in the gospel has a human-ward dimension as well as a God-ward dimension. The reconciliation goes in both directions. Using the terms of the last post, the church is a sign of God’s arriving kingdom. And a whopping big one at that! Here the community of believers is to be the visible expression of the Father’s glory, of the light that is coming into the world. And this expression is to be noticed, seen by all. Gulp! Jesus will no longer be physically present, no longer will people be able to look and see him. But his presence will not be lost: it will continue in the company of disciples. From now on it is them people must look at and see Christ. As the new and heavenly love among the believers is noticed, people will realise that this is the new community, the new humanity which Jesus is creating. Onlookers will find it hard to deny the message of Christ and his cross which the disciples bring – for they will be confronted with the reality and power of it at the very same time. It will be ‘in their faces’: for the congregation which announces the gospel also demonstrates its reality – by existing! Just think on those last 6 words. It is extraordinary – and a bit scary – to think that we play such an important role in the authenticating of the gospel. But that is clearly how Jesus and Paul saw it. To sum all this up, it is not enough, not nearly enough, for the church to speak the Word of Christ. It is called to this, yes, but to much more as well. We are called to embody and display that Word visibly. For it is not enough for people to hear the Word. They must see its power demonstrated – in the present, in us. The light set on a hill – that light is us. If we are not being presently transformed, then our message is discredited, and why would anyone believe it? If people can’t see Jesus in our renewed community, why should they believe he is alive and active anywhere? Our Protestant tradition of hearing-not-seeing the gospel doesn’t really leave room for an ecclesiology of this sort. One where the church-as-community has a vital role as gospel-embodiment, that is. Denigrating sight in favour of hearing necessarily implies minimising the place of the congregation in God’s purposes. For the congregation doesn’t really need to embody anything, if embodiment is not of much importance. Moreover, a focus on congregational life could be seen as potentially idolatrous, a hankering after something visible in the hear-and-now. Such distractions may be thought to lead us away from an undivided focus on Christ. In fact, in the Protestant movement, ‘the church’ has often been treated as a rival to the gospel. ‘They’ are committed to church, while ‘we’ are committed to the gospel. I hear people talk like this pretty often in my evangelical circles. Built into this thought-structure is an anti-church tendency. We don’t hate church, we tolerate it. But nor do we love it, or trust it. Or expect much from it. It comes naturally to us to operate at a ‘para-church’ level, where most of these issues are sidelined and we can devote ourselves to a pure ‘word-only’ ministry. Our favourite! He quoted Robert Jenson’s famous statement: God is whoever raised Jesus from the dead, having first raised Israel from Egypt. That’s what stuck with me: not being in control. For Israel, election started off as a kind of crazy rollercoaster ride, they never knew what was around the next bend. They were totally in God’s hands. When you read the adventures of the early Christians in Acts and elsewhere, it seems our election in Christ is pretty much the same. Not in control: I sense that we are struggling to adjust, after more than a millenium of church-state connection taught us to see Christian faith from the point of view of the powerful insider. It’s only been a few hundred years that that power has been on the wain, and only recently that we’ve felt really outsiders. Back in 1959, Sydney’s newspapers promoted the Billy Graham crusades. Now they are hostile or indifferent to Christian faith. So now we’re not in control, and we need to reframe our faith, retell our story, rethink our practises, reinvent ourselves. We need to get comfortable with this. At present we’re still longing for the old power back, still wanting to tell our society what to do, etc. We’re still worrying that the media doesn’t like us, and desperately trying to turn that around. It’s time to stop. I think we need some time out in the wilderness with God, like Moses, to adjust our bearings. We’re not princes in Egypt any longer. When we come back, it will be as prophets, not princes. We must embrace an identity that is alternative, unpopular, edgy, shameful, subversive. Christian faith began as an underground movement, and it’s time we got back to those roots. The upper room. The catacomb. Speaking psychologically, you understand. STEP 1: sell the Cathedrals. They are our strongest link with our privileged, insider, establishment past. They are powerful symbols of being in control. They are now part of the problem, hindering us from adjusting to the new reality. Everything we like about the cathedrals is why we should sell them. We need to stop liking those things. Cathedrals are things to repent of. This may seem to painful to contemplate. But friends, we’ve already lost our identities. Losing the cathedrals is surely a small price to pay to regain our own selves. I should clarify: SH did not say sell the cathedrals. That is my take on living out his program of learning to not be in control. I As a friend texted me the other day, Hauerwas is the man to help us negotiate post-Christendom. And boy do we need help! I’ve been working on Luke 12 Jesus’ teaching about wealth and life and death. Jesus has warned us not to fear bodily death so much but to fear ‘the one who has power to cast you into Gehenna’ (12:5). Then as an example of what to truly fear, he says ‘Beware, keep guard against greed‘ (12:15). It seems greed is one of the things that has that power to destroy. Jesus specifically warns about ‘abundance of possessions’ (12:15). Then we get the parable of the rich landowner destroyed by money. I’ve got some questions about that landowner. Hoping to get some help from the brains trust. First, why is he so very bad? God calls him ‘Fool’. Not many people get called ‘fool’ by God in the Scriptures. And it seems at the end that he loses his life in a pretty final way. A ‘casting into Gehenna’ way I would guess. But why this guy? He didn’t hurt anyone did he? Doesn’t seem to have done anything spectacularly wicked or cruel. We don’t read that he mistreated his workers or anything. Why is accumulating wealth so wrong? So deadly? I’ve known lots of people who did it, they seemed like nice people. This parable makes it sound like you can follow God or you can accumulate wealth, but not both. Is that true? Can you be rich, AND be a Christian? Subsiduary question: does superannuation count as ‘storing up possessions’ for the future in the style of the rich fool? Or is it something different? I only ask, because we’re all doing it, right? The blessings of God… flow from Christ into us: from us they must flow into others who are in need of them, and in such a way that I must place before God even my faith and righteousness for my neighbour, to cover over his sins, to take them upon myself and act precisely as though they were my own, just as Christ has done for us all. Martin Luther, ‘On the Liberty of the Christian’. Hmm… We would never talk like this.